Leading the evolution of Digital Door Locks, the Lockwood CORTEX™ is a commercial grade Digital Lockset, offering a standalone electronic access solution that complements existing systems. Innovative locking coupled with the durability and quality that is synonymous with the Lockwood brand. 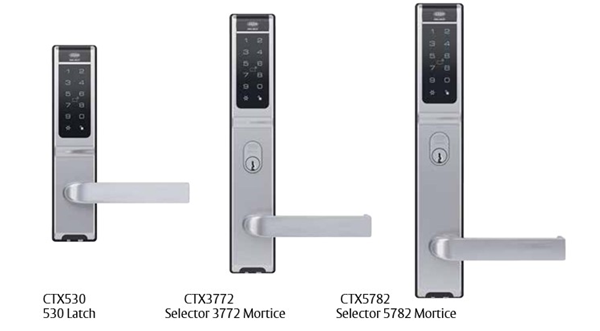 CORTEX™ is the premium choice for intelligent locking. Lockwood CORTEX™ meets AS4145.2 Standard for Security SL8 and Durability DL8 and the Lever: 77A.Is compliant with AS1428.1-2009 for Disabled accessible compliancy. CTX530 and CTX3772 has successfully been tested up to 2 hours on fire door assemblies in accordance with Australian Standard AS1905.1 2005 – Part 1: Fire Resistant Doorsets. CORTEX™ offers a range of unique electronic features including time and date programmable functions and compatibility with high security iClass™ and the popular Mifare™ Card formats.